Those of you that know me know that that I’m fairly competitive. Maybe fairly competitive is an understatement. I like to do well, I don’t like to fail. I’ve been that way all my life. I’ve been lucky that many things have come very easy for me. However, I always try to do one thing with everything I do and that is do my best. When I started doing agility with my dogs, I had NO idea of what I was getting into. I took Noodle to a puppy class and then the second class that had some puppy agility…and then…well you know how it goes. I was hooked on training. I started out in obedience, that’s what Noodle’s mom did so that what I thought I’d do with her. I did a bunch of classes and had lots of fun. Noodle and I got out CD with an average score of 198.5 out of 200. Not bad for my first competition dog. Did I say, I like to do well? I worked a lot, took private obedience lessons and practiced a lot. Noodle LOVED her cookies. When she was about a year old, I started my first agility class. WOW was that fun! I started classes in November and entered my first show in July. What I know now is…that was WAY too soon, but what did I know then. That first show…well was an eye opener. 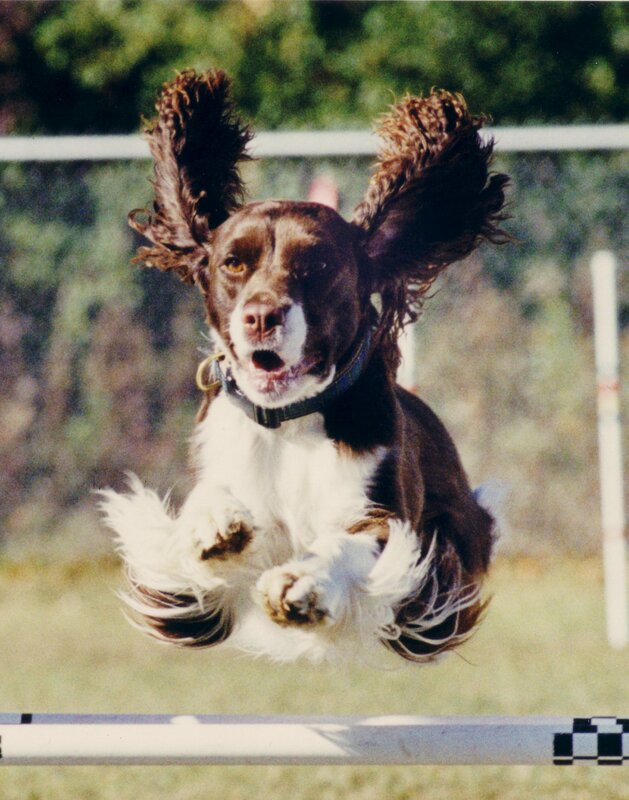 It was standard, I set her up at the first jump and what did my favorite Springer do? She turned her head and started sniffing toward the concession stand that was popping popcorn! Well she came off the start line and all was good until we hit the chute. It was a cut out of a frog and had big beaty eyes looking down. Noodle ran up to it full speed, put on her breaks, stopped dead in front of it and BARKED…I was mortified. I couldn’t get her through the chute for anything so after about 4 or 5 tries and went on. She then went on to walk over the broad jump. I think she missed the weaves too, but by that time I just wanted to get the heck out of dodge. I liked to win things and I failed. Of course there were a lot of things she did very well, but at that time, no one had told me about TEAMWORK with my dog! Noodle had fun once she got over the fact there was a frog on course. I almost went home, but someone said that I really should stay and try and run her in Jumpers. I wasn’t sure…I had second thoughts on if she was ready to be showing and what the heck was I doing out there. I had NO CLUE! Another thing I’ve never done is QUIT. I’m not a QUITER. So I stayed and ran in Jumpers…well that run is the run that did it. We Q’d (qualified for you non-agility folks) and took 1st place. We got a blue ribbon…I won! I was hooked…I was on Cloud 9…I was so happy with my little brown dog. We came back for the second day of the trial and got pretty blue ribbons in both Jumpers and Standard. She did the chute! I guess she realized the crazy frog wasn’t so bad anyway. Or maybe I was less nervous or something crazy like that! That weekend sealed the deal – I was hooked on AGILITY. Stay tuned for part 4 – hopefully fairly soon!